The robe is wrapped around both Christ and the Theotokos? I see His head, hand, and feet. The description I included pretty much says that it's of Christ's removal from the cross. Beyond that I'm not entirely sure. What an addition to my schlock file! The Salvador Dali description suits it perfectly. It's just as weird and disturbing as the triple-headed Trinities, as well as being way, way off theologically. It's like a levitation magic routine! I imagine an accurate name for it would be something like "The Pieta Both Crucified and Enthroned". may I suggest she appears to be sneaking Our Lord into the cinema, under her overly large cloak? "Our Lady of the one ticket-two entries", comes to mind. The Matrioshka doll "icon". It's the equivalent of the equally uncanonical Paternity. It has the added bonus of the mother of St Anna standing behind her daughter. Most versions I've seen of this schlock omit her. Have a version of this in my house. They have brought much consolation to the people around me. This is either a segment from the icon of All Saints, or of the Last Judgement. The inscription on the right reads [All] the saints entering Paradise. Some of the saints are easily identifiable, including Apostles Peter and Paul, and Cyril of Alexandria. The seraph guarding the entrance to Paradise has raised his swords to allow their passage. Paradise is represented by the walled garden (a place of light, a place of green pasture, a place of refreshment, whence pain, grief and sighing have fled away, as funeral and memorial hymns say), in which can be seen Abraham with the souls of the righteous in his bosom, the crucified thief who confessed Christ, and the Mother of God. Bad theology is bad theology, no matter how you slice it. 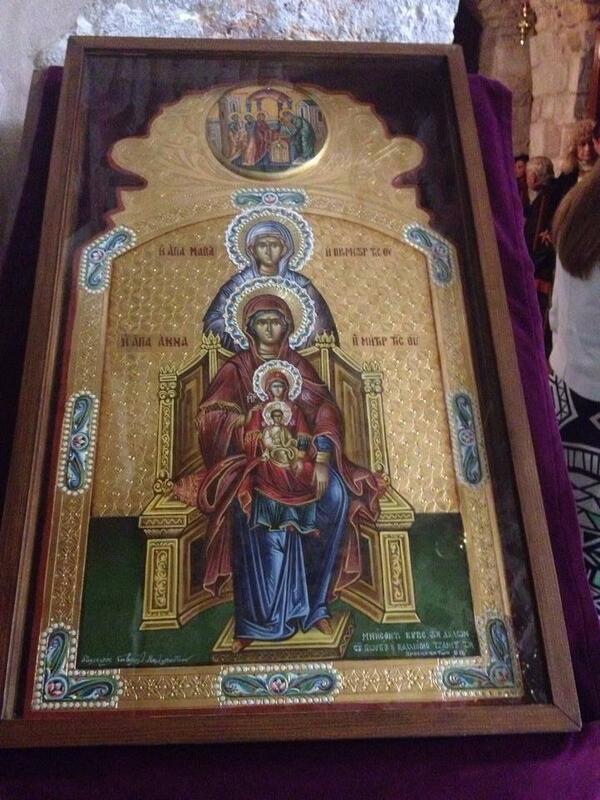 Does that mean that the icons that show St. Anna, the Theotokos, and Christ in a similar manner are bad icons? Is the woman all the way up top supposed to be St. Anna's mother? What is her name? Yes, that woman is supposed to be St Anna's mother. The inscription reads "St Maria, Foremother (grandmother) of the Mother of God". What needs to be remembered is that any reference to the mother of St Anna is practically absent in Orthodox tradition, and there is nothing I have found in sources that she is indeed a saint. No feast date, nothing. I'll add the following about that image: Just as the uncanonical Paternity image paints a false Trinitarian theology, in not only showing God the Father in a form which He has never been revealed, but speaking of an inequality of the three Persons, the Maternity image expresses the quasi-trinitarian idea of a "Mother, Daughter, Holy Grand-daughter". Okay, I thought my Google-fu was broken because I wasn't finding any reference to her either. I find the fact that they just made up a name for her to be stranger than depicting her. Is it out of Revelation, maybe? *524. A RARE ICON OF "THE PURE SOUL"
Allegorical depictions of Pure and Sinful Souls are known in Russian art from the latter half of the 16th century, often in illustrated manuscripts commemorating the dead (necrologies). Judging from the unusual white background, the artist replicated a miniature from a book. The Pure Soul is depicted on the left as the Virgin in real attire and wearing a crown adorned with flowers. To her right is a lion (anger), a serpent (sin) and on the right, squatting naked in a cave, is the devil, symbolising the sinful soul. Christ enthroned in heaven above, awaits the worship of the Pure Soul and Guardian Angel. At the centre is the Sun with a human face and the border texts explain what is depicted. In the 18th-19th centuries, edifying works about the Pure and Sinful Soul were in demand amongst Old Believers, both icons and printed sheets incorporated texts from either a necrology or the Blessed Monk Dorotheus's Thirty Great and Original Virtues, which formed part of the Tsvetnik (Flower-bed), a book widely popular with Old Believers. It is in the latter where the deep meaning of this edifying subject finds its fullest expression: “Human purity attaches man to God, and the purity of God dwells in man” (Tsvetnik of the Blessed Monk Dorotheus, Grodno, 1790, p. 187). An important distinction of this icon is that the detailed border inscriptions bear no relation to either literary sources. Addressing the viewer — an extremely rare feature in an icon — the lower border reads: “See, O man, the parable of life painted here: if thou wilt ascend to the heavenly kingdom, then preserve thy purity of soul, otherwise thou shalt suffer eternal torment”. Given the rarity of the subject and the detailed, original text, this icon is of considerable interest and belongs to a particular edifying type of Old Believer icon painting. If you have any concerns, ask your priest. Ignore LBK. Funny you say that, I received it from our presbytera. It seems that it is not strictly an "icon" as many of us would understand it, but an illustration in an iconographic style. Such images were common in Russia between the 16th and 19th centuries. Some pretty weird stuff exists from then. Unfortunately, they are unsuitable for veneration, as they are imaginative and allegorical. At best, they could be seen as didactic. Beauty alone does not make an icon proper. A beautiful icon which does not express what the Church teaches and believes is no icon at all. The Schlock Icons thread is full of "beautiful" images which are theologically rubbish. You are drawing a connection Maria has not made that beauty=canonicity. She merely said it was beautiful and told me to ask the advice of my priest. She also stated "ignore LBK". Yet, not so long ago, she sought my advice on an icon she was after. She can't have it both ways. If you're anything like the saints you can have a good understanding of theology and still be wrong sometimes. Exactly. Even saints are not infallible. Christ is the only sinless One. Antonis and Maria, I would be delighted if you could provide us all with a thorough analysis of the theology of that image, and how it conforms with the liturgical, patristic and doctrinal traditions of the Church. I would say the burden of proof lies with you, as my spiritual father, the abbots of at least two monasteries, and at least two Orthodox metropolitans here in America accept it as perfectly fine. And if you're going to do so, I would ask that you please cite sources, instead of long soliloquies that we are just supposed to accept because you are you. I do not like that one. It obeys the canonical rule of "St Joseph's restraining order," though. The court must have also ordered that he look sad every time he's around Jesus. Mustn't think he's trying to upstage the Theotokos! That's not an answer to my question. I do not speak from myself, but from the traditions of the Church, and I do provide sources from Tradition to back what I write. If I am so wrong in my criticism of this image, then, please enlighten us all with the reasons why it is suitable for veneration. I agree. It is not sufficient to read only what LBK posts, we need her citations so that we know she has done the research if she is going to present herself as the OC.net expert on iconography. By they way, how many Icons has LBK written? 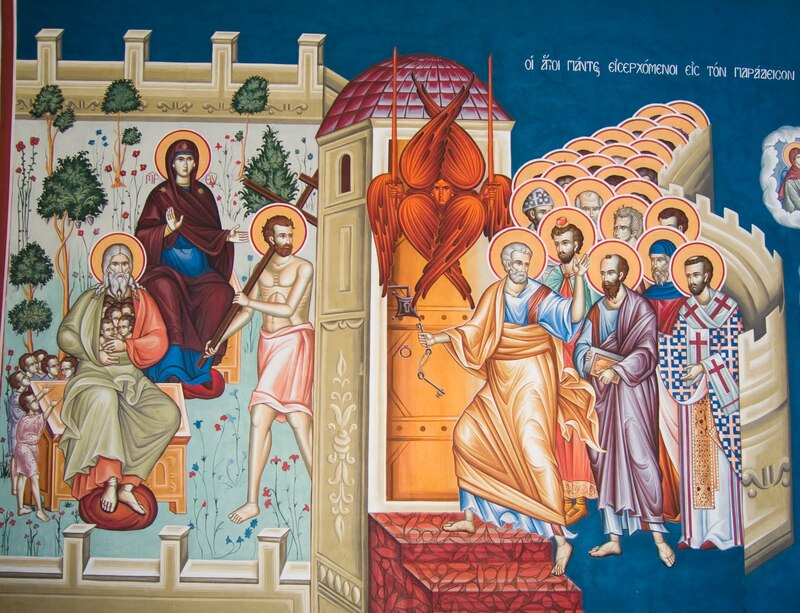 The icon that Antonis has posted is perfectly canonical showing the ancestors of Christ. These were holy women. If we were to imitate the lives of these women, there would not be less flame throwing or baiting going on. The burden of proof falls on you, as you were the one who said it was not canonical. How many icons have you painted, Maria? By what liturgical, patristic, historical, and doctrinal authority do you claim the image is "perfectly canonical"? Where is your proof, LBK? You falsely claimed it was not canonical when Antonio's Presbytera gifted it to him.